The experience of the hundredfold. Now. of Don Giussani and the Communion and Liberation movement. we can hardly comprehend it. even less to shift our attention to any possible responsible parties. the question raised by our experienced impotence facing the earthquake. to life and death, to victims, to survivors, and to us. It sustains our hope. everything else along with Him?» (Rm 8,32). "If faith is to recognize a Presence that is certain, hope is to recognize with certainty a future that is born of this faith; faith is to recognize a Presence with certainty; from this certainty, certainty for the future is born. To recognize the content of a Presence that began two thousand years ago, to recognize it present now. What is this called? Memory. Therefore hope has a radical link with the word memory, so that without memory there can be no hope." "Without memory there can be no hope." The example that comes to me is that of Massah and Meribah. The note in the NAB Bible for Exodus 17:7 reads "Massah... Meribah: Hebrew words meaning respectively, 'the (place of the) test,' and 'the (place of the) quarreling.'" The people of Israel had no hope because they had no memory. Imagine: living as slaves in Egypt, living through the 10 plagues while the Egyptians were afflicted, walking through the Red Sea and seeing Pharaoh's army drowned as they pursued, singing the great song of Exodus 15 — which we remember every Easter! — Imagine: after all this, coming into the desert and then despairing at what would happen next. So when Moses splits the rock, he's striking God's heart (the objective correlative of quarreling with God), and this is what we do when despite our personal history, despite the two-thousand-year history of the Church, despite the history of Israel — despite all this, we test God and pierce the side of Christ. I had always thought of Moses getting water from the rock in a pragmatic sort of way: the people were thirsty and God provided water to them. No — the mercy is that despite our despair and faithlessness, God remains faithful; despite our betrayals and incoherence, God offers mercy and forgiveness and even continues to sustain us corporally and provide for our bodily needs. I don't want to dwell on this sin, except to say that there is a point of decision, a point where one decides to risk with the One who has begun a good work in us. Instead, it's better to remember our history (putting ourselves into past events as a witness): to read the Hebrew Scriptures and the New Testament, to read the Fathers of the Church, and those other times and places where Christianity has been lived vibrantly, to look at those places and events (the Portico of Soloman) where God's glory is being revealed now. Got hope? Get memory. Lent, Holy Week, and Easter — like Passover — is a time of memory. How can we build unless we first look to the foundation that God has built? I've been living for a couple of weeks with these questions before me: what do I love? what do I fear? what makes me rejoice? what makes me sad? Lest I deceive myself, St. Bernard reminds me to "observe carefully" - in other words, what I love, what I fear is revealed in my actions, and can be observed when I catch myself off guard or when I face an unexpected problem. What do I love: what do I make time for? What is it that I do when I have a free moment? What do I fear: what do I avoid and why? More often than not, it's the unknown that I fear - which is silly because in every case that I've met the Unknown (every day of my life!) - I am always surprised by its goodness. Rejoicing and sadness are a bit easier, because in both cases something happens first which causes me to rejoice, which causes me to be sad. One thing I discovered (in sales over the phone) is that hearing no doesn't make me sad; instead, both no and yes cause me to rejoice. What saddens me is when judgment is evaded, or if someone lacks affection for themselves and their employees. Something that occured to me in reading St. Bernard's exhortation: what should I love? what should I fear? What love and fear are "involved when you turn to God with your whole heart"? As a monk, St. Bernard knew that the answer to this question was readily available to the monks in the Psalms, our school of affectivity. or honey from the comb" (NAB). If we read the Psalms paying attention to these words: happy, fear, love, rejoicing, we begin to discover a new affectivity, a renewed way of meeting the world. (Sermo 2.3 in Quadragesima PL 183: 172D). I am so moved by what happened during and after our Fraternity (of Communion and Liberation) Lent retreat this weekend. Between the content of all Fr. Roberto said and his sharing his life with us, there is so much to turn over in my heart. But what is standing out for me so powerfully is Fr. Roberto's insistence that we meet Christ in everything that happens, as it happens. There is no separation between Christ and my work, Christ and my friendships, Christ and my heart. All of reality is infused with his miraculous Presence. In which case, before I can serve Christ in you, I must first meet him in you. That is, when I come face-to-face with you, I am coming face-to-face with the Lord of history, in all the Mystery and awesome power that that entails. By "you," I don't just mean you to whom I'm writing now -- I mean every person (and really all Creation!). Sometimes we worry about the lack of reverence we or others have in front of the Eucharist -- what about our colossal lack of reverence in front of each other? So, then what is the purpose or special role of the baptized, if all reality is Christ meeting me now? We are baptized into this awareness (the better word is faith) and our life's work is to witness to one another about this Reality, this fact of existence. As witnesses, we must continually testify to Christ's Presence to one another -- and not let any one of us forget or slip into vagueness on this point. And because the witness testifies, he takes on the role of Christ; his witness means that he conforms more to the person of Christ, so that he, like Christ, is the one who makes this Presence known and felt in the world. In other words he manifests, more profoundly and more acutely, this Presence of Christ and is thus recognizable as a member of the living Body of Christ in the world. So let's do the work of looking, of reminding ourselves that Christ is before us continually. Let's tell each other what we see! So, my question to everyone is, what's happening? What do you see? And when we tell each other what's happening and what we see, let's do it out of charity to one another -- as the most important charitable work there is -- we will be helping one another to see one miracle after another. And we will get better and better at seeing these things, the more we practice this looking at reality with new eyes. Yesterday, when the retreat was over, I drove Anna (a high school girl from Italy who is spending a year in the U.S.) back to her host parents, she spoke to me about how loving and generous this couple was, and about her deep affection for them, which was evident in every word. She told me about how the wife was expecting her first baby in July and about how she (Anna) was leaving in June and would miss seeing the baby -- with a little regret but not deep disappointment, because she is certain that either they will come with the baby to Italy to visit or she would be back to see them again. I was moved for several reasons -- but mostly because a girl her age could leave her home and her friends and travel from a rather large city (Milan) to a tiny town in Ohio and develop such deep affection for a couple of adults whom she could have easily treated as simply a launching pad for her American adventure with other American teenagers. But it was even more astonishing to meet her host father. There was nothing cosmopolitan or fascinating about this man on the surface, but Anna loved him as a father, this much was evident. I remembered Fr. Giussani's definition of forgiveness: the capacity to tolerate difference. What mercy I witnessed in the five minutes I stayed in that home before heading back to my home! The way Anna loved this man was a keener witness than anything she could have said about this relationship. May we love one another in this way!! Here is my summary of pages 28-40 of the 2008 Spiritual Exercises of the Fraternity of Communion and Liberation ("This is the Victory that Conquers the World, Our Faith"). These pages will be the focus of the Fraternity Lent retreat this year. We first receive this life, which derives from faith, at Baptism: "The only thing that makes faith reasonable is its promise to bring us life. This is why God intervened in history, to bring us this life, and this life reaches us in Baptism" (p. 28). "Baptism is the sacrament of faith, which, however needs the community of believers" -- "Baptism encorporates us into the community of believers through the fact of becoming one person in Christ" (29). But if we're not careful, we can reduce our companionship to its external appearance: "If there's not a personal 'I' that says 'You' to Christ, as you say it to a man who is present, Christ is 'bleached or faded away from the beautiful and glad appearance of the companionship of faces that should have been a sign pointed to Him!' but we stop there; we stay there with the sign. "It's as if one of us had received a stupendous bouquet of flowers, and never tired of talking about the bouquet of flowers, but felt no urgency to say the name, to speak about the person who had given the flowers." Two temptations to avoid: "first, conceiving a Christ without Church, that is, excluding Christ from reality, to a far-away supernatural world, and reducing Him to our interpretation or our measure, or, second, having a Church without Christ, where the Church is perceived not as the body of Christ, that makes Him present, but as the substitution of Christ. "Jesus Christ isn't a presence isolated in far-off history, so as to seem the fruit of imagination. He is a Presence ten years after His death, a thousand years after His death, two thousand years after His death, up to today, through this different humanity of the saints, a human presence impossible to think up" (33). "Anything but Christ in the abstract! He is something so real that through His historical presence in the Church and His witnesses, He becomes a reality that can't be reduced by any attempt of ours, challenging man's heart, reason, freedom, and affection. Anything but abstract!" 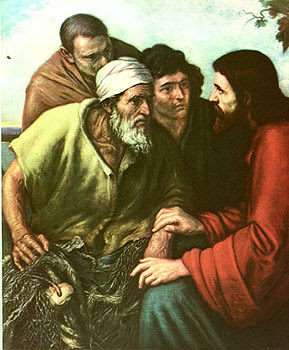 "Our companionship isn't here to spare us the drama of freedom, but to continually provoke our responsibility.... 'Our companionship means not to let time pass without our life asking, seeking, wanting the relationship with God present and without our life wanting or accepting that companionship, without which not even the image of His presence would be true'" (34). "Christ reaches us through our communion to introduce us to a relationship with Him, so the Mystery may become familiar" (34). "The test of faith, of the true relationship, not virtual, not with someone abstract, is satisfaction. Only if we experience faith as satisfaction, the greatest satisfaction one can imagine, because of the hope that He has brought forth in me, do we have an experience so powerful that it sustains all of life, because life consists in the affection that sustains us most, not outside reality, that sustains in satisfaction, in the unique correspondence that Christ is for life" (36). "The new knowledge is born of the adhesion to an event, born of the affectus for an event to which one is attached, to which one says yes. [ You have to say yes. Faith is a free gesture: you need to say yes to this event, so that this newness can begin to happen.]" (37). "To think, starting from an event, means first of all accepting that I don't define that event, but rather, that I'm defined by it" (37). "the new judgment is possible only in a continual relationship with reality, in other words, with the human companionship that prolongs in time the initial Event: it proposes the authentic Christian point of view. The Christian Event persists in history, and with it persists the origin of the new judgment" (38). "Remaining in the position of origin in which the Event brings forth the new knowledge is the only chance for relating to reality without preconceptions" (38). "In order to acquire this, a work is necessary. 'For the mentality to be truly new, it's necessary that out of its consciousness of "belonging," it continually engage in comparison with present events. Since this new mentality is born of a present place, it judges the present. Otherwise it doesn't exist: if it doesn't enter into the experience of the present, the new knowledge doesn't exist, is only an abstraction. In this sense, not to make judgments on events is to mortify faith'" (39). "Faith grows in this way, risking it in reality and challenging everything with Him in our eyes. This is why it's not a matter of learning a discourse by heart and repeating it, but learning a gaze, says Fr. Giussani" (39). "How can we learn this gaze? 'It's a matter of staying before the event encountered': it's the precedence given to the event, to what happens, to what He does" (39). "Mission can be nothing other than a more acute awareness of what Christ means for life, because only to the degree that we live this newness will we feel the urgency of mission" (40).